Being able to watch how molecules bend, stretch, break, or transform, during chemical reactions requires, to an extent, state-of-the-art instruments and techniques that can observe and track, with sub-atomic spatial and few-femtoseconds temporal resolution, all the atoms within a molecule and how they behave during such a change. About 20 years ago, scientists came up with the great idea of using the molecule’s own electrons to take snapshots of the structure and to view, in real time, the molecular reaction. A breakthrough to image complex molecules came in 2016 when the team of researchers, led by ICREA Prof. at ICFO Jens Biegert, was able to achieve the required spatial and temporal resolution to take snapshots of molecular dynamics without missing any of its events, reporting on the imaging of molecular bond breakup in acetylene (C2H2) [Science 354, 308 (2016)]. Now the research group has gone beyond their previous discovery and achieved another amazing milestone in their research. In a recent study published in the Proceedings of the National Academy of Sciences of the United States of America (PNAS), ICFO researchers Dr. Kasra Amini, Dr. Michele Sclafani, Dr. Tobias Steinle, Aurelien Sanchez, led by ICREA Prof. at ICFO Dr. Jens Biegert, have been able to observe the structural bending and stretching of the triatomic molecular compound carbon disulphide, CS2. This study was carried out together with ICREA Professors at ICFO Maciej Lewenstein and Javier García de Abajo and former ICFO researchers Jose Martinez, Michael Hemmer, Michael Pullen, and Benjamin Wolter, in collaboration with researchers from University of Warsaw, Kansas State University, Friedrich-Schiller University Jena and the Abbe Center of Photonics, the Max-Planck-Institute für Kernphysik in Heidelberg, and Physikalisch-Technische Bundesanstalt in Braunschweig. 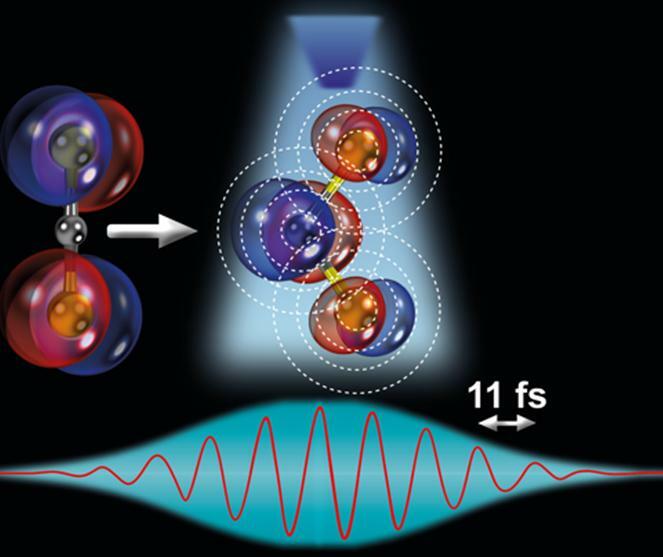 To observe this phenomenon, the team of researchers used laser-induced electron diffraction, a molecular-scale electron microscope that allows scientists to peek into the molecular world to capture clean snapshots of the molecule’s geometry with combined sub-atomic picometre (pm; 1 pm = 10-12 m) and attosecond (as; 1 as = 10-18 s) spatio-temporal resolution. They reported that the ultrafast modifications in the molecular structure are driven by changes in the electronic structure of the molecule, governed by an effect known as the Renner-Teller effect. Such effect is key for important triatomic molecules such as carbon disulphide, CS2, since it can determine specific chemical reactions in our earth’s atmosphere that could, for example, affect the climate conditions. Now, for the first time, the team was able to directly image this effect in their experiment, obtaining snapshots in real-time, seeing the molecule stretch symmetrically and bend in a linear-to-bent structural transition within ~85 fs (8 laser cycles). This was possible thanks to the use of a state-of-the-art quantum microscope composed of: (i) a mid-infrared 3.1 μm intense, femtosecond laser system that illuminates a single CS2 molecule with 160,000 laser pulses per second; and (ii) a reaction microscope spectrometer that can simultaneously detect the full three-dimensional momentum distribution of the electron and ion particles generated from the ionization and sub-cycle recollision imaging of a single isolated molecule. To confirm their experimental findings, the team also performed state-of-the-art quantum dynamical theoretical simulations, and verified the match between theoretical and observational results, confirming that ultrafast linear-to-bent transition is indeed enabled by the Renner-Teller effect. Such findings signify a major step forward in understanding the underlying effects that take place in molecular dynamic systems. ICFO – The Institute of Photonic Sciences was founded in 2002 by the Government of Catalonia and the Universitat Politècnica de Catalunya (UPC), both of which are members of its board of trustees along with the Cellex and Mir-Puig Foundations, philanthropic entities that have played a critical role in the advancement of the institute since 2007. Located in the Mediterranean Technology Park in the metropolitan area of Barcelona, the institute currently hosts 400 people, organized in 26 research groups in 60 state-of-the-art research laboratories. Research lines encompass diverse areas in which photonics plays a decisive role, with an emphasis on basic and applied themes relevant to medicine and biology, advanced imaging techniques, information technologies, a range of environmental sensors, tunable and ultra-fast lasers, quantum science, photovoltaics and the properties and applications of nano-materials such as graphene, among others. In addition to two state awarded Severo Ochoa accreditations of excellence, ICFOnians have been awarded 15 ICREA Professorships and 34 European Research Council grants. ICFO participates actively in the European Technological Platform Photonics21 and is also very proactive in fostering entrepreneurial activities, spin-off creation, and creating collaborations and links between industry and ICFO researchers. To date, ICFO has helped create 7 start-up companies.